The UK government’s climate policy is undergoing a slow sacrifice at the alter of commercial interests. Today’s revelations that the UK government has been secretly doing the bidding of the “Big Six Energy Companies” by arguing against action on energy efficiency and renewable energy at the EU level is just the latest in a long string of evidence that our government is prepared to pander to the whims of business rather than protect our common future. [Update: on June 14 The Guardian reported that the UK government was successful in watering down EU energy efficiency targets]. The recent publication of the Draft Energy Bill appears to light a flame underneath the UK’s hard-fought for Climate Change Act by advocating pointlessly weak standards for the efficiency of new electricity generating plants. Even worse, the bill gives a get out clause for new coal plants as long as companies say they might capture and store some (unspecified amount) of their carbon emissions, somewhere, somehow at some unspecified point in the future. Today’s revelations start to fill in the wider picture of the UK’s influence on climate policy beyond the domestic arena, adding to what we already know, for example, about the UK’s indefensible support of the Canadian government in its promotion of oil from the tar sands in Europe. Here’s a selection of press quotes about our Tate a Tate audio tour Drilling the Dirt (A Temporary Difficulty). Amidst its lofty rhetoric about excellence and sustainability the London Olympics have chosen some of the world’s most unethical companies – including BP, Dow Chemical and Rio Tinto – as corporate sponsors. Phil England presents powerful first-hand testimonies from victims and campaigners dismayed and angry at this betrayal. Read the full report for Ceasefire magazine. I am privileged to be working with a new collective of young film-makers in Cairo. Each dedicated to making their camera count. We call ourselves Mosireen, or We Are Determined. We work fluidly and interchangeably and with increasing efficiency and remarkably little ego. Four days ago we finished a film on the martyrs of the Egyptian revolution. The film ends with a scrolling list of all the names of the dead. It is the first time they have been gathered and listed together. Three columns of names run across the screen for over two minutes. It is heartbreaking. We screened it on a makeshift cinema that we erect in Tahrir whenever we can. This is the second in a series of extra materials relating to our alternative audio tour for the Tate Modern exposing the impacts of BP’s day-to-day business. Due to time constraints, this interview didn’t make the final edit of our Drilling the Dirt (A Temporary Difficulty) audio tour. In it, Omar Robert Hamilton sits in the cafe outside the Tate Modern and speaks about Egypt under Mubarak, artistic repression in the country and why he thinks the Tate is wrong to take money from BP. Omar Robert Hamilton is an English-Egyptian film-maker and producer of the annual Palestine Festival of Literature. BP’s cultural sponsorship seems to be spreading like a rash. They evidently feel they have a lot to do to win back the public’s confidence in their brand. In the latest twist they are sponsoring The World Shakespeare Festival. But fear ye not, as actors, directors and playwrights have piped up denouncing the fearful brand’s despoiling of the favoured Bard. And cheeky activists too, have taken the Bard’s lyrical language and exposed the dirty deeds of the ones that seek to profit from their association with such cultural treasures past. And lo’ did the audience think their performance and message was good… Follow their exploits here. Damien Hirst appropriated our work! The new Damien Hirst retrospective which opens tomorrow 4th April at Tate Modern has forced a last minute revision of our BP themed alternative audio tour. 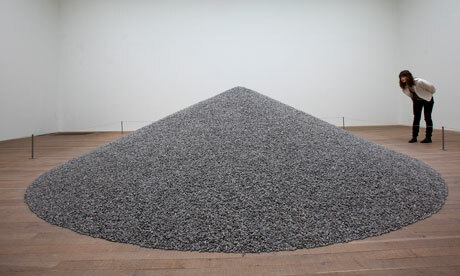 The Hirst exhibition appropriated the floor space which contained Ai Weiwei’s Sunflower Seeds – one of the featured artworks in our Tate à Tate audio tour. This forced us into a last minute revision of the work before the launch – necessitating the selection of a new work, writing a new section of the guide, re-recording our trusty narrator Josephine Borradaile, creating new sound design, re-editng, remastering and re-uploading the work. Our unauthorised audio tour Drilling The Dirt (A Temporary Difficulty) was successfully installed in the Tate Modern on Friday 23rd March. It is part of a series of three works critical of Tate’s complicity in BP’s social and environmental crimes through its acceptance of BP sponsorship. We have archived the Ai Weiwei section here for your enjoyment and edification. Tate recently purchased eight million of Ai Weiwei’s porcelain Sunflower Seeds for an undisclosed sum. In 2008 Damien Hirst donated the proceeds from the sale of one of his artworks to Survival International. With his new show opening at the Tate Modern, Damien Hirst has a powerful opportunity to make a public statement against the treatment of the Canadian indigenous peoples who have been impacted by BP’s interests in the tar sands. For more on BP and Shell’s meetings with the UK government in the lead up to the 2003 invasion of Iraq see the minutes obtained under Freedom of Information by Greg Muttitt. class="archive paged category category-misc category-7 paged-4 category-paged-4 samba_theme samba_responsive wpb-js-composer js-comp-ver-4.7.4 vc_responsive"